Do you like granola but find many store-bought (and even homemade) varieties include ingredients you'd rather avoid? 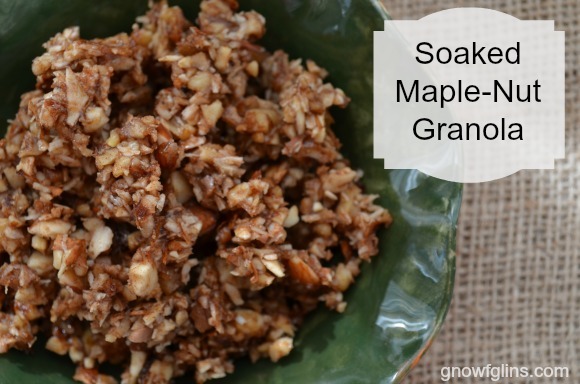 If so, I think you'll enjoy this soaked maple-nut granola. It's grain free, uses nourishing ingredients, is packed with nuts, and is bursting with flavor. Nuts contain enzyme inhibitors, which make it difficult to digest them or absorb the nutrients contained within. So, it's important to soak them before use. The soaking helps activate the nut and removes the enzyme inhibitors, making them easier to digest and more nutritious. So, don't skip this step. Soaking nuts does require some time, but very little effort. Simply pour water over the nuts, add salt, and leave overnight (further directions are included below). This granola is an excellent gluten-free or grain-free treat, and can be used as a breakfast cereal option or topping over yogurt (or any other way you would use granola). Dried fruit, berries, or raisins can be added at the very end, if you desire. Use honey, and less of it, to make it GAPS-friendly. Yields 8 cups (approx.) granola. Adapted from Against All Grain. Place all nuts in a large bowl or jar. Pour clean water over the nuts until they are well covered (at least an inch of water above the nuts). Add 2 teaspoons of the salt and gently stir to combine. Cover and let sit for about 24 hours. 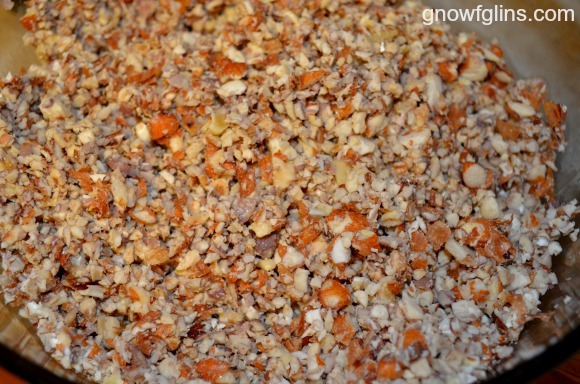 Pour into a large bowl and add the rest of the nuts to the food processor and pulse until the nuts are small. Add these nuts to the large bowl with the others. Add the maple syrup, coconut oil, cinnamon, vanilla, and remaining 1-1/2 teaspoon salt to the nuts and stir to combine. Stir in the coconut until evenly distributed. Spread granola over dehydrator trays lined with drying sheets or parchment paper. Turn dehydrator to 120 degrees Fahrenheit and leave for 24 hours. 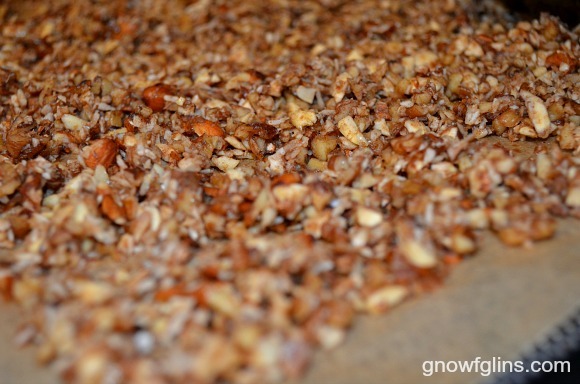 Turn off the dehydrator and allow granola to cool before placing in an airtight container for storage. Granola will crisp further as it cools. Don't have a dehydrator? Use the oven. A dehydrator will make a superior granola since the lower temperature allows the nuts to maintain much of their nutritional value. Heating in the oven will destroy some of the nutrients, but it is still a method you can use if you don't currently own a dehydrator (although I highly recommend you try to get one in the future. They are so useful!). To dry in the oven, preheat to 170 degrees Fahrenheit. Place granola on trays lined with parchment paper. Make sure the granola is in a thin layer and not piled high. Put trays in oven and leave the oven door propped open a crack to let the moisture out. Bake for 2 hours, then stir with a wooden spoon and bake for another hour. Turn the oven off and close the door all the way. Let dry for one more hour. Do you like granola? What is your favorite flavor? Favorite ingredients? Favorite recipe? 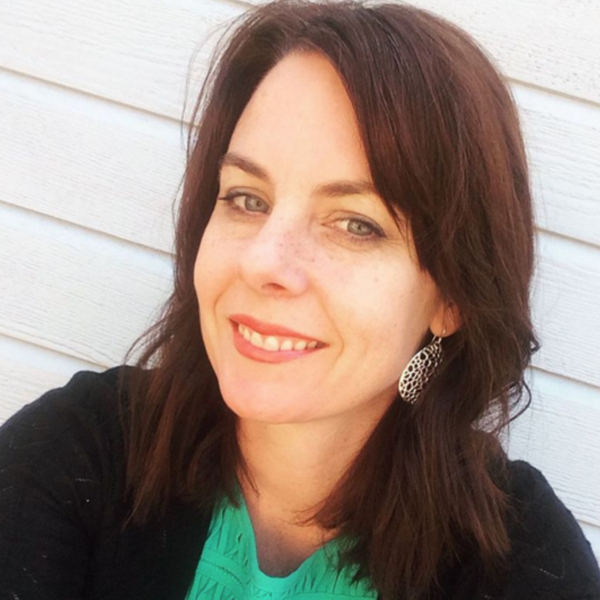 Feel free to share links! Interested in more help with grain-free or other allergen-free cooking? Check out our Allergy-Free Cooking eCourse. This looks yummy- been a long time since I made granola so this recipt just made me want to make a batch 🙂 Do you store this in the refrigerator and can it also be stored in the freezer if you make a large batch that will not be eaten up too quickly as nuts seem to go rancid quickly? This recipe sounds wonderful. In fact I have most of the raw nuts soaking now. My comment is that I have heard from a number of sources that raw cashews should NOT be soaked for longer than 6 hours. If they are, they get slimy. I can vouch for this because I had soaked them for longer thinking that I was doing great and my cashews were so slimy that I had to discard them. This recipe calls for all nuts (including the cashews) to be soaked for 24 hours. Did you really mean ALL nuts should be soaked for 24 hours?? I just got through making this recipe. It was by far the MOST delicious granola I have ever tasted!!! Wow!!! I won’t be able to make this a lot because I could set down and eat the whole batch of it. I did only soak my cashews for only 4 hours. This recipes was easy to make and so-o-o-o very yummy. Can I add oatmeal to this? Thanks! I love nuts, love eating healthy; but some of these “healthy” recipes bother me because they can’t even be ranked amongst ‘fakeout’ foods. It won’t taste anywhere NEAR the real food because one or all of the core ingredients are removed.